A Liberal's Libretto: Reality TV Star - Rolando Villazon? Reality TV Star - Rolando Villazon? "New classical reality show" - THERE'S a phrase I never thought I would see in print. Of course, it's not in print in the Unites States. Are you kidding me? Our NASCAR loving culture would rather keep up with the Kardashians, the "Real" "Housewives" of [insert city here], or spend their time voting for the least repulsive singer on American Idol. No, this new classical reality show is making it's debut on ITV in the United Kingdom. And get this: Pop Star to Opera Star will include as a "mentor", Mr. Vocal Health himself, Rolando Villazon [R.]. Coronation Street's Kym Marsh is bidding for opera stardom on a very different kind of reality show. The former Hear'Say singer has signed up for ITV's new classical reality show Pop Star to Opera Star. She will be mentored by Welsh singing sensation Katherine Jenkins as well as famed tenor Rolando Villazon as she pits her arias against those of her fellow celebrities. And with classically-trained musician Myleene Klass hosting the show, alongside Alan Titchmarsh, it seems that classical music is all of a sudden very cool. Even Susan Boyle is rumoured to be jumping on the bandwagon, and is said to be performing with opera legend Andrea Bocelli. Now Friends, there are many things that are strange in this equation. But, those Britons tend to do things a little differently - so, who am I to judge? Right? Wrong-o. I hopped on the express train to Judgmentville as soon as I saw: "opera legend Andrea Bocelli". Classically PREPARED singing legend - maybe. But OPERA legend? Mmmmm - not so much. Unless, of course, you subscribe to the definition of "legend" which states: "A romanticized or popularized myth of modern times". Then, I'll give you "opera legend Andrea Bocelli" as a romanticized myth. Getting back on point, the premise of the show is that the cast of pop artists will prepare to perform operatic arias. Many of these artists will be singing in another language for the first time, which should be interesting. Not quite charmed by the idea, yet? Would you be sold if I told you that the cast of artists includes Jimmy Osmond? Yes, THAT Jimmy Osmond - as in, Donny and Marie's brother. What about if I told you that they were going to be judged by rock legend Meat Loaf and interior designer / Classic FM DJ Laurence Llewelyn-Bowen? I thought so. You can't help but watch the train wreck as it happens. For more on Pop Star to Opera Star, including cast names and pictures, go to MailOnline. Rupert Christiansen Telegraph article: Pop Star to Opera Star: TV won't make any pig's ear the next Domingo. 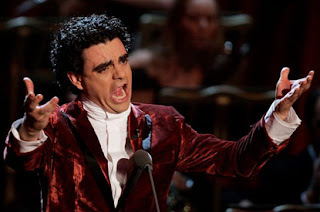 Rolando Villazon may bring a necessary dose of negativity to ITV's new 'classical reality' show. Thank you to Aria Serious for bringing this to our attention.